This page describes the Xbox 360 HDMI Cable, which is compatible with the Xbox 360 E console, the Xbox 360 S console, and the original Xbox 360 console. The Xbox 360 HDMI Cable connects the Xbox 360 console to a high-definition TV that is equipped with an HDMI port. The HDMI cable can be used only on an Xbox 360 console that is equipped with an HDMI port. Note HDMI cables that are not produced by Microsoft will work with an HDMI-equipped Xbox 360 console. The Xbox 360 HDMI Cable carries video of up to 1080p resolution and Dolby Digital 5.1 audio over one cable. The cable can be daisy-chained: You can connect the cable to other HDMI-compliant devices, such as an audio decoder, which is then plugged into the HDTV. Or, you can plug the cable directly into the TV. When you use HDMI, you should not have to set your Xbox 360 Dashboard resolution. The console detects the display’s optimal resolution over the HDMI cable and adjusts the resolution automatically. The Xbox 360 HDMI AV Kit includes a second cable, the Xbox 360 Audio Adapter. Note The Xbox 360 Audio Adapter is not compatible with the Xbox 360 E console. This device resembles a small AV pack that has only stereo RCA jacks and an S/PDIF optical connection, or TOSLINK port. The audio adapter cable can be used with the HDMI cable. 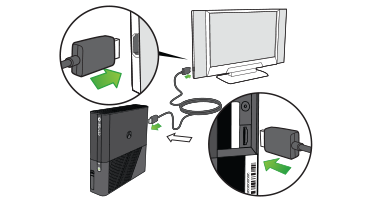 If both cables are plugged in, the Xbox 360 console transmits audio over the audio adapter and video over the HDMI cable. This gives you flexibility if you want to connect the HDMI port to your HDTV, and you want to route audio to a non-HDMI device. Note The Xbox 360 S console features a TOSLINK input jack on the back of the console. With this console, you do not have to use the audio adapter for digital audio. However, either connection method will work in the same manner. If you have an audio receiver that has optical audio input, connect your optical audio cable to the HDMI Audio Adapter (by using a TOSLINK connector). The Xbox 360 S Console features a TOSLINK input jack on the back of the console. In this case, you do not have to use the audio adapter for digital audio. However, either connection method will work in the same manner. If you have an audio receiver that has analog audio input, connect your audio cable to the HDMI Audio Adapter. Would you like to contact Support regarding the "Xbox 360 HDMI Cable connection info" issue you were reading about or a different issue?